It is not often that we dine at Michelin star restaurants so when we do, it makes it extremely special and memorable. It’s even more precious to share the dining experience with a loved one. 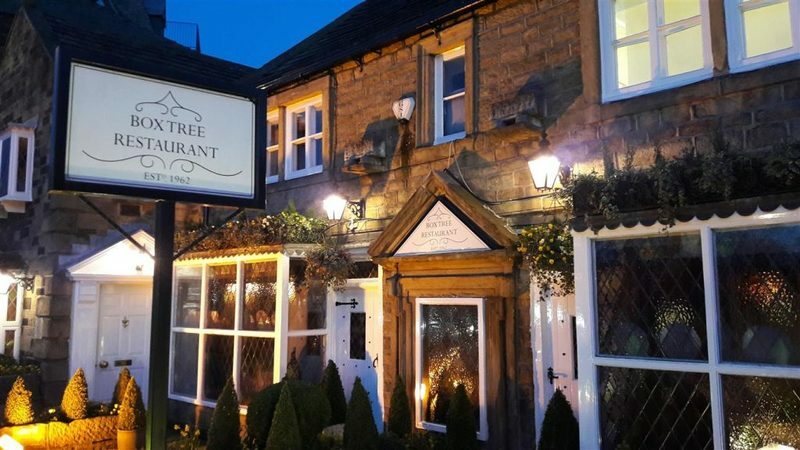 The Box Tree was established in 1962 and the setting is a Yorkshire stone farmhouse. The restaurant gets it’s name from the box trees planted in the front garden. 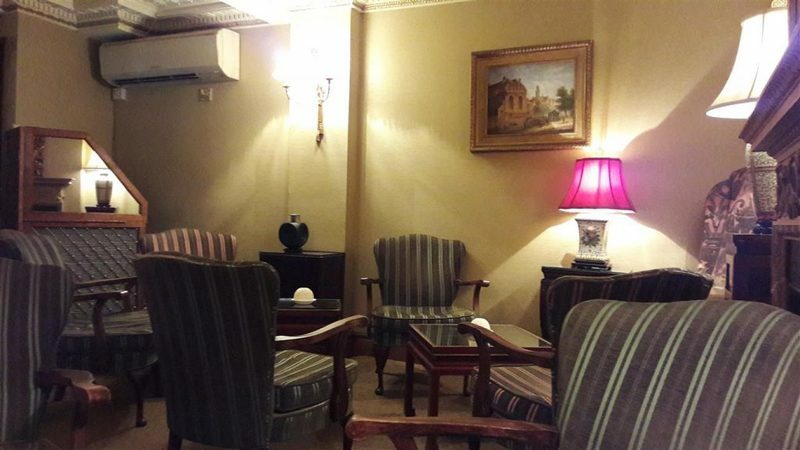 The evening started off with being seated in the cosy lounge area. Striped armchairs, a fireplace and lamp lighting made for a nice environment to have our drinks. Both of the juices were Frobishers and given in tumblers at room temperature as requested. 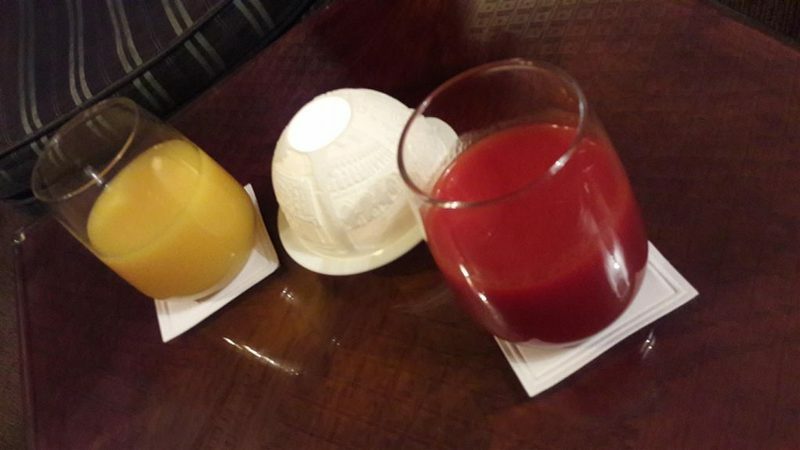 A thick rich tomato juice and a sweet, slightly tangy orange juice were chosen. A few cute canapes were given to accompany our drinks. 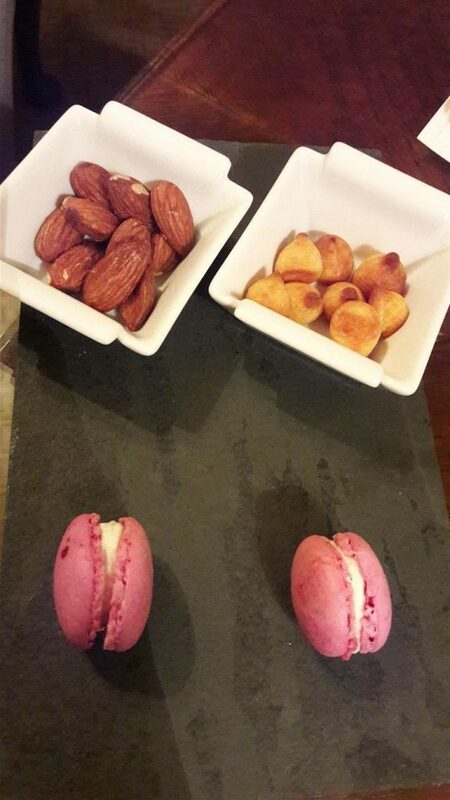 Roasted almonds, cheese bites and cheese filled pink mini macarons were presented to us on a slate plate. 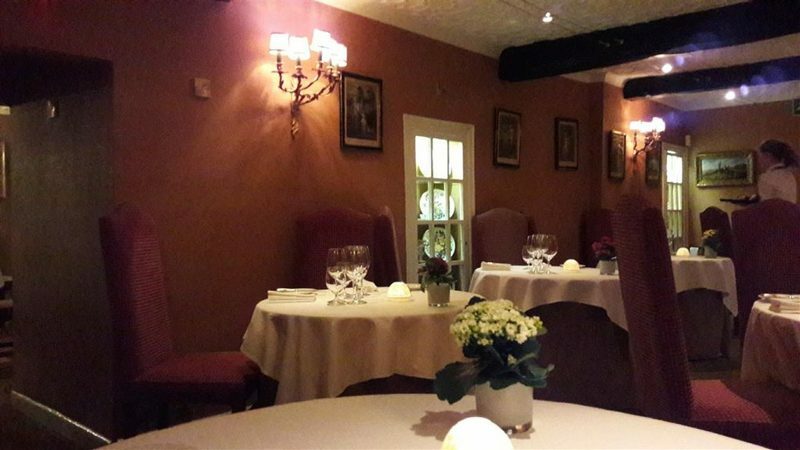 As The Box Tree had asked for dietary requirements when the booking was made, we were informed which dishes would be suitable for our meal. The waiter went through the selection with us and took our order before we were shown through to the dining area. The dining area had softer lighting than the lounge. Big round tables and cushioned red chairs made up the seating. Many awards were displayed by the stained glass windows. 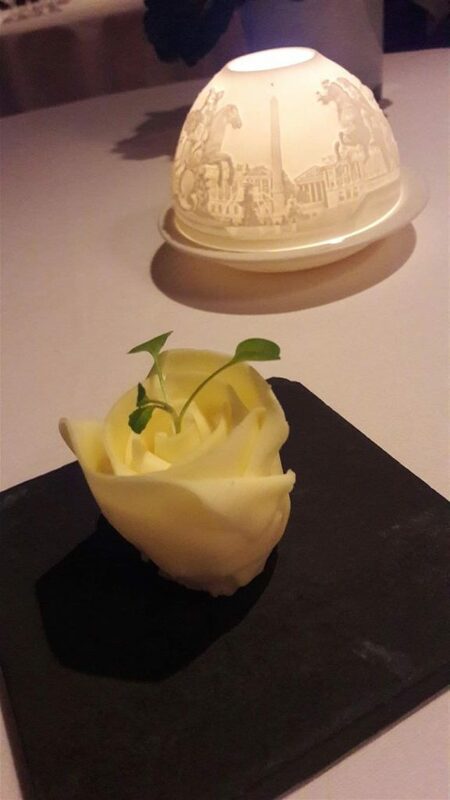 A beautiful butter rose made for a delicate yet striking table centrepiece. 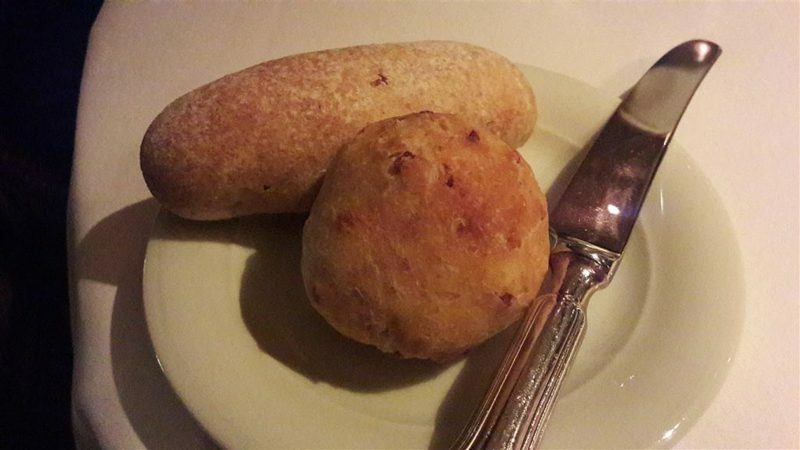 Warm soft bread rolls were given to start off the meal. These were an onion white roll and a country style brown roll. An amuse-bouche then followed the bread. The chef’s selection this time was an Onion and Lemongrass Foam dressed with coriander oil. The teacup may have been small but it was filled with a strong flavours. The Grilled Crotin de Chavignol was the main piece of the starter. 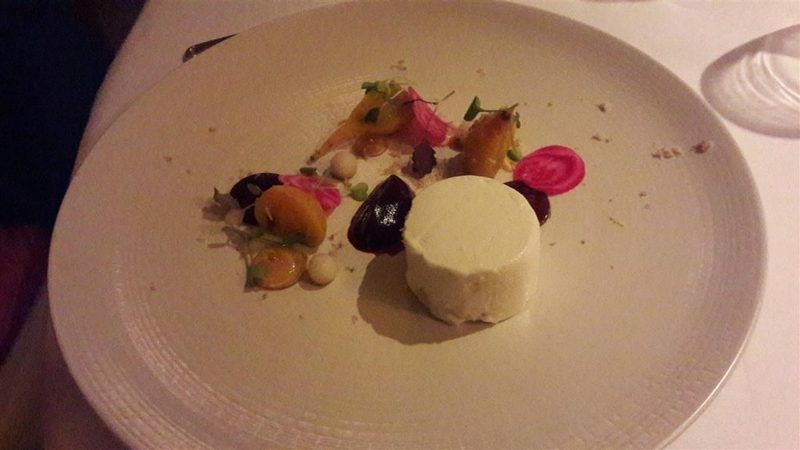 Gorgeous shades of pink, purple and yellow beetroot contrasted the creamy goat’s cheese. Sweet compressed pear and walnut nougatine complemented all the other elements of the dish. 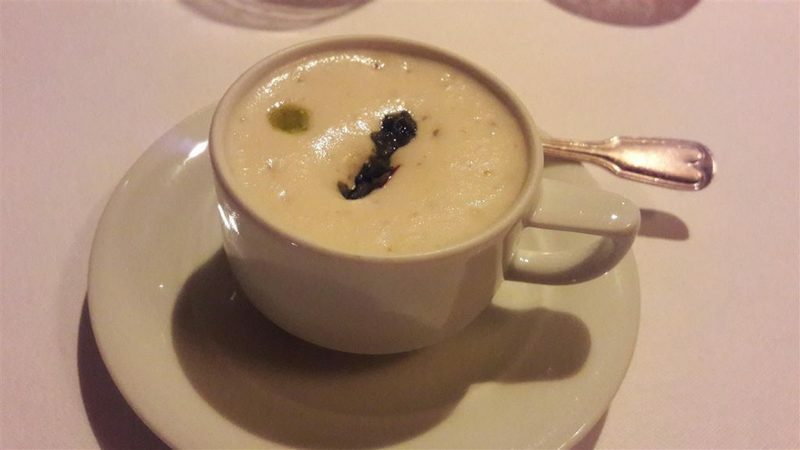 A creamy Potato and Lovage Soup was wonderful. 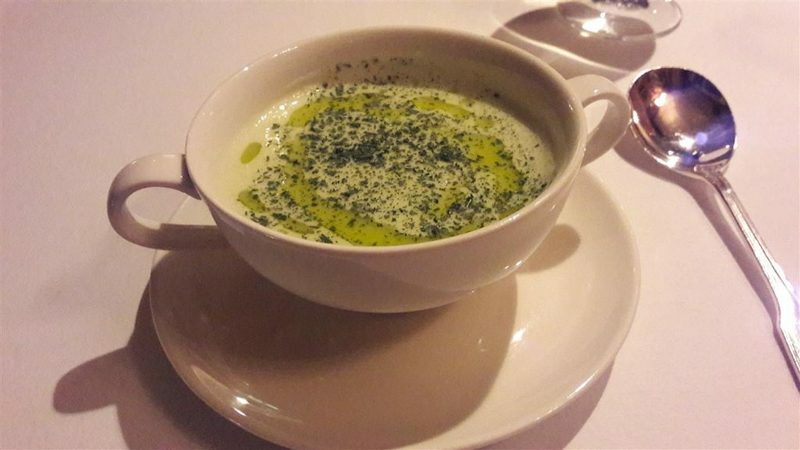 It contained confit potato and the lovage gave the soup an additional depth of flavour. Onto The Box Tree main course which was Butternut Squash and Ricotta Ravioli. This tasty pasta parcel was topped with maple syrup glazed squash. The bitterness of the grilled chicory was balanced with the sweetness of the squash. 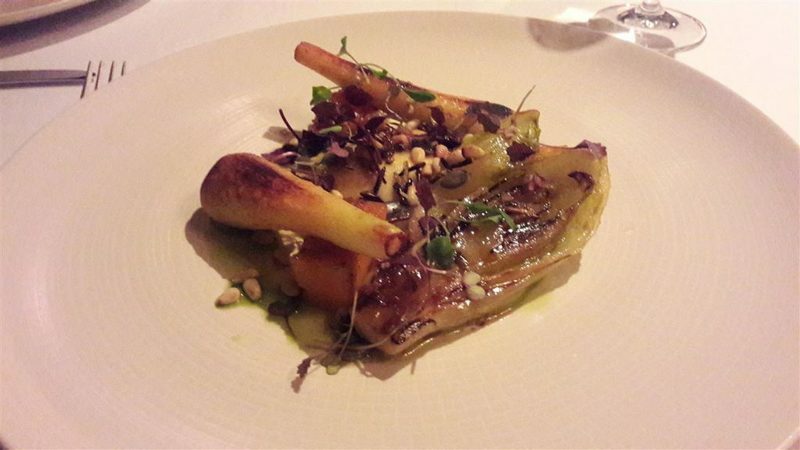 Roasted baby parsnips, pumpkin seeds and pine nuts were all dressed in a thyme beurre noisette. The butternut squash together with the ricotta was a lovely combination. Each vegetable and component had it’s own wonderful flavour as well as them all working in sync with each other to give a delicious taste. The staff gave us plenty of time between the courses. Even though the dessert was ordered at the end of the meal, time was given for us to relax before our sweet delights were given to us. Both of the desserts were ordered; it was the only way to finish our meal. The Passion Fruit Souffle was light as a feather. 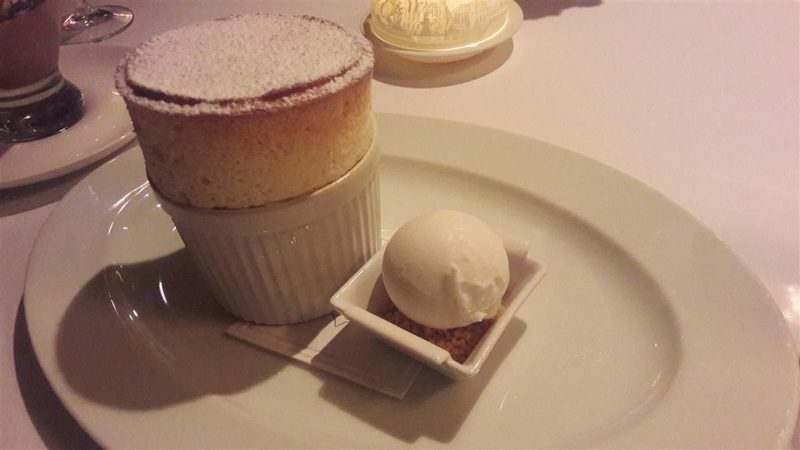 A slightly crispy top gave way to the melt in the mouth souffle. There was a tang from the passion fruit which went well with the coconut ice cream. 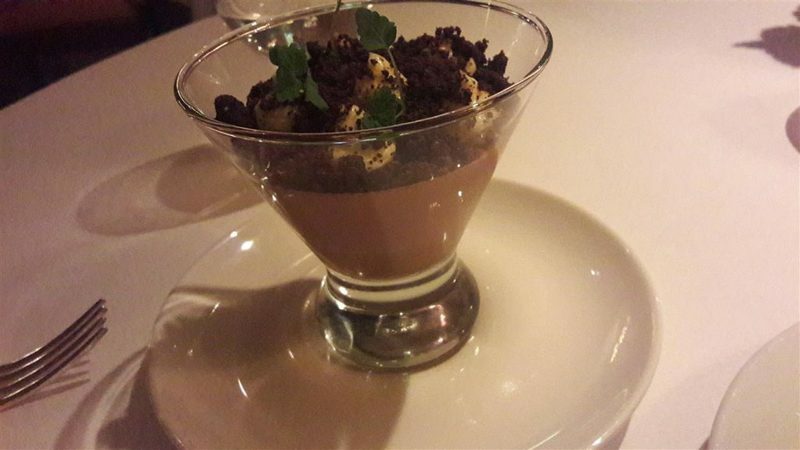 The warm souffle was followed by the Verrine of Milk Chocolate. Rich chocolate with caramel and citrusy kalamansi was delicious. Both of the desserts were indulgent just as desserts should be. 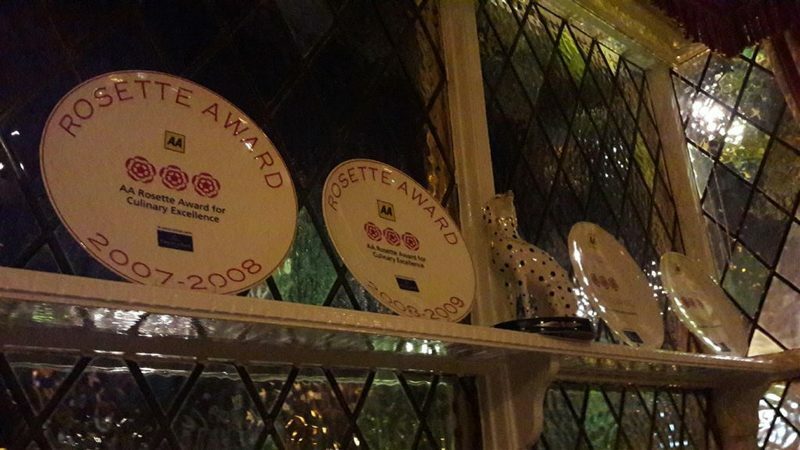 The Box Tree excelled with its faultess food and service. It was a dining experience that will always be treasured.